Published Jul 21, 2017 by Pearson IT Certification. Part of the LiveLessons series. Hands-on computer networking skills are highly prized in today’s job market. The Building a Computer Network LiveLessons video training course offers more than four hours of quick, hands-on, solutions-based instruction on installing and configuring modern networking devices, clients, and servers. Leading computer expert and trainer David L. Prowse brings together all the core knowledge you’ll need to build networks from the ground up. Prowse’s eight well-organized lessons and 35 concise sublessons teach through live action demonstrations; video lab screencasts with specific objectives and lab diagrams; and screencasts with detailed explanations, tips, and guidance for verifying correct configurations. Ideal for all aspiring and entry-level IT professionals, this course will also be an especially valuable complement for CompTIA Network+ and A+ certification preparation. 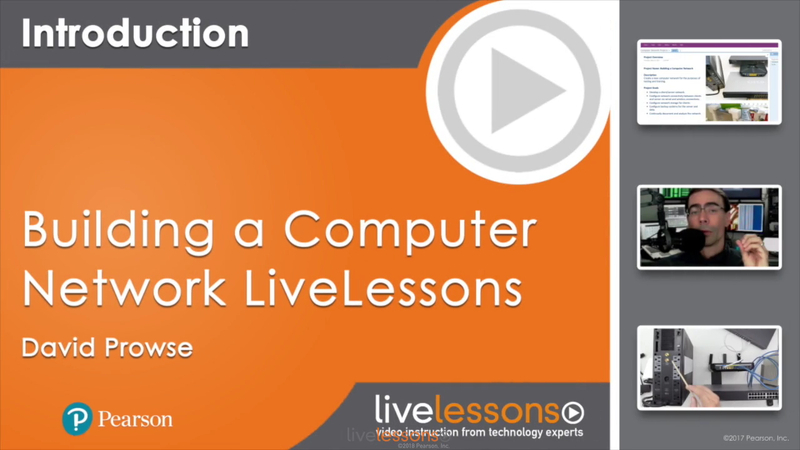 If you’re ready to start or advance your networking career, the practical knowledge in Building a Computer Network LiveLessons will set you apart from your competitors. For all aspiring and introductory-level PC, help desk, or network technicians, and other entry-level IT professionals, especially those currently studying for Network+ or A+ certification. Requires a basic working knowledge of computers.